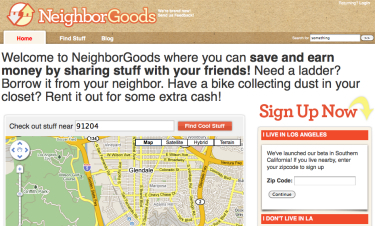 Share With Your Neighbors At NeighborGoods. There is absolutely no reason why everyone in your neighborhood needs their own lawnmower, snowblower or gigantic ladder – why not share the cost with a few close friends? I know I have talked about this stuff before, but I just found this site called NeighborGoods that will help you find those around you with the “stuff” you need to borrow. From tools to books to sporting equipment, the site wants to become the main hub for you and your neighbors to start sharing with each other. You can even rent out your belongings for money, if you are so inclined. But I like the sharing aspect better. I think they are just getting started, but you would be wise to put your name on the site in case others in your area join up too! I only wish I was the guy who thought this up–what an excellent idea!! My next door neighbor and I have been doing a small scale version of this for years. I know I can verti-cut his yard and mine within the four hour minimal rental for that equipment at a local outlet. So we split the cost, use his truck to pick it up, I do the cutting and we take turns buying coffee afterward. Works the same with other rentals too. We’ve even had our driveways resealed at the same time so that the guy who does that for us gives us a break on the service call.